There's no more fussing about with shared folders when using Dropbox any more, as the cloud storage service has just added the ability to share ANY file in your Dropbox account. 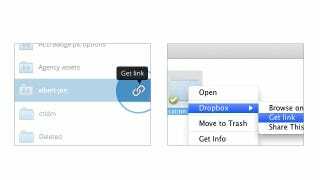 It works with a simple right-click through the Dropbox menu (or icons within the web and mobile apps), where a new "Get Link" tab now appears. Clicking on this generates a URL to that particular file, letting you ping the address out to anyone. Pics and videos display on a Dropbox branded web page, with movie files streaming in through a Flash player. Update A representative for Dropbox contacted us to tell us that, as a company, Dropbox "explicitly prohibits copyright abuse."